In a Nutshell: Through conscious social investment in women, Bank of America has become one of the most progressive banks in the US when it comes to gender equality in the workplace. With a global workforce that’s more than 50% female, the drive for inclusion and parity shows in the numbers. BofA also boasts the highest-ranking female executive among the major banks, Anne M. Finucane, Vice-Chairman and head of the company’s environmental, social, and governance (ESG) efforts. Recognition for BofA’s gender equality efforts are reflected in the company’s inclusion in the 2017 Bloomberg Financial Services Gender-Equality Index, a listing of companies that most support the development and success of women in the workplace. When we think of the major US banking giants, for many of us it’s in terms of the financial crisis of a decade ago. Global market turmoil, the downfall of centuries-old institutions, and the terrible effects of the Great Recession, all had a significant impact on our collective psyche. What we may not be aware of, however, is just how far the big banks have come in the ensuing decade. One example is Bank of America, which has quietly evolved into a model banking institution, with progressive policies and a renewed commitment to doing well by doing good in the community. As part of its focus on community and social responsibility, BofA has made a commitment to building diverse and inclusive work environments. The bank has also partnered with more than 200 colleges and universities to develop programs and business networks that help women advance in their careers. This commitment to progressive workplace policies and benefits has resulted in some industry-leading programs, like 16 weeks of paid parental leave and assistance in caring for aging parents. According to some within Bank of America’s management team, these progressive policies and benefits are a direct result of the growing number of women occupying leadership roles at the bank. One of these leaders is Anne Finucane, Vice Chairman and a member of the company’s executive management team. She is also responsible for strategic positioning and leads the company’s environmental, social, and governance (ESG) efforts. 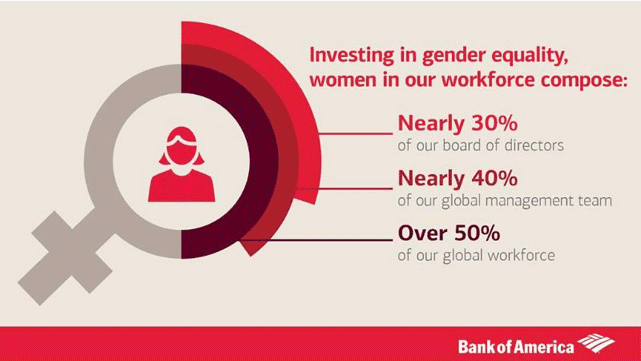 With its commitment to strong female representation, more than 50% of BofA’s global workforce is composed of women. In addition, nearly 40% of its global management team and 30% of its board of directors are women. This exceeds industry benchmarks for female representation and is among the highest in US banking. Many significant reports by third-party agencies have indicated Bank of America is at the forefront of gender equality and diversity in the workplace. Some of these reports include Oliver Wyman’s “Women in Financial Services 2016” report, and the “2016 Global When Women Thrive” report. In addition, five senior executives at the company are ranked among the top women in banking by American Banker magazine. BofA is committed to advancing women’s economic opportunities around the world through initiatives that help empower them to make significant contributions within their communities. Through partnerships with groups like the Institute for Economic Empowerment of Women (IEEW) and the Tory Burch Foundation Capital Program, BofA provides training, mentorship programs, and affordable loans to female-owned business. Perhaps the most obvious example of BofA’s efforts toward gender equality is the position achieved by Anne Finucane, as mentioned earlier. As Vice Chairman of the bank’s board of directors, Anne is the highest-placed female executive at any major US bank. This achievement is due entirely to Anne’s accomplishments throughout her long career, and is also an example of BofA’s ongoing commitment to gender equality at the highest levels. As Chair of the Global ESG Committee at BofA, Anne is responsible for the strategic positioning of Bank of America and leads the company’s environmental, social, and governance efforts. That includes creating innovative ways to deploy capital and providing leadership on the company’s environmental business opportunities initiatives, and responsible growth strategy. Anne is also deeply committed to the advancement of women in the workplace. Anne is one of the most trusted advisors to CEO Brian Moynihan, and her influence on the bank’s progressive hiring policies can’t be overstated. One of the most often-repeated quotes from Anne tells us a lot about her commitment, not just to individual causes, but to doing the right thing as a leader. For the second straight year, Bank of America has been named to the Bloomberg Financial Services Gender-Equality Index (BFGEI). This recognition is further evidence of the company’s investment in women as an investment in the future. Being included in the Bloomberg Gender-Equality Index for a second year was based, in large part, on BofA’s strong representation of women at all levels within the workforce. 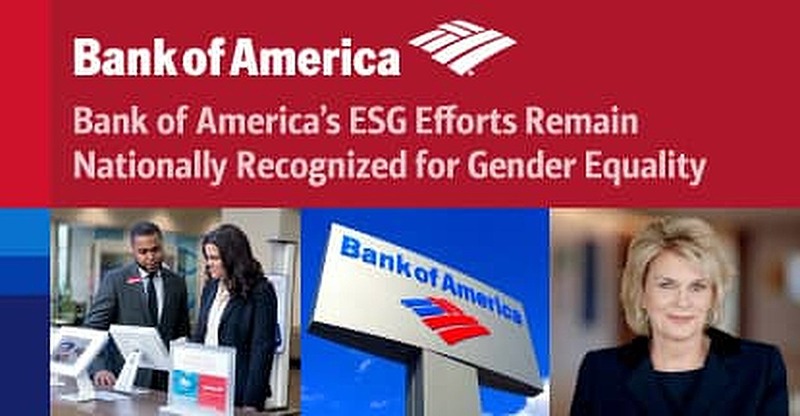 It also took into account the various talent development programs, industry-leading benefits, and BofA’s leadership role on gender issues within communities. Among the outside agencies and groups that partnered with Bloomberg to select the recipients of this year’s award were Women’s World Banking, Catalyst, and Working Mother Media. Only 52 firms were listed in the 2017 Bloomberg Financial Services Gender-Equality Index, making inclusion to the list quite an honor. Bank of America continues to move forward with its progressive policies and focus on gender equality at all levels. This, along with a commitment to community and social issues, means we can likely expect even more good things in the future from the second largest bank in the US.